This new release has given me great pleasure – one of the most satisfying albums of chamber music I have reviewed in recent times. 1875 must have been a happy year for Saint-Saëns. It was the year he married. That same year he composed his glorious Fourth Piano Concerto and Danse macabre as well as this very approachable B flat Piano Quartet. The genial, melodic opening movement contrasts calm and commotion but it is predominantly sunny and relaxed, sophisticated and well-mannered, occasionally stately and dignified; sporadically agitated. The Schubert Ensemble play with spirit, attack and real delight. The second movement is an extraordinarily interpretation of its description Andante. It forgets its manners for it opens in rough temper although calm is soon reached. By two minutes in, the piano has poured oil over troubled waters although the strings rarely cease their agitation and scurrying. Considering the character of the ensuing third movement, a Mendelssohnian scherzo, one begins to wonder if there will be a real slow movement. This lively scherzo, full of good humour, proceeds through a series of accelerandi to a hopeful Prestissimo that the composer leaves to the players’ discretion. The Finale moves to a more earnest mood and chromaticism and something of Schumann is apparent. The movement is cyclic and recalls material from the earlier movements. 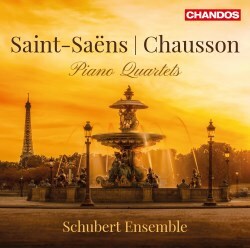 The Chausson Piano Quartet is equally satisfying if not more so. It's a charismatic work, its delicate sensitivity safe in the hands of the Schubert Ensemble. It is more solemn in character with a charming opening movement denoting a mood of searching yearning and uncertainty. It can be dreamily melodic. The piano part, in the hands of William Howard, has a beguiling, pellucid beauty. Influences? Wagner and César Franck are suggested. There is a hint of folk music too but the thrust is idiosyncratically Chausson’s. The second movement is beautifully, intensely romantic with the mood suggesting devotion. The music works up to a passionate affirmatory climax. The brief third movement has its roots in a folksong with its tune in the Phrygian mode. Debussy and Ravel are at Chausson’s shoulder here. The strongly rhythmic and rather turbulent Finale is energetic before a waltz section calms the atmosphere and romantic yearning is recalled. Very rewarding in every sense.